World," or the locale could not be more appropriate, in the light of all the changes and new poli- cies that are taking place in gov- ernment, which so affect the mar- itime and related industries. Plaza Hotel, the meeting will feature addresses by key mari- time leaders, sessions of techni- cal papers, panel discussions and other elements that will make up an outstanding program. Research), and now combined with its Spring Meeting. All pro- gramming efforts are being di- rected by the Society's host Ches- apeake Section, the Steering Com- mittee under Walter Schmid, and the Technical Program Commit- tee led by Marvin Pitkin. Changing World." A panel dis- cussion of all these speakers will conclude the first day. There will be many opportunities for regis- trants to participate in the dis- cussions. Eisenberg, on "New Directions for Offshore Development," and the other by Wolfgang Reuter, on "Education to Support Ship De- sign and Construction." Eighties," Marvin Pitkin, Tech- nical Program Chairman. Marine Industry" by Anthony L.
Kucera, president, American Wa- terways Operators, Inc.
Paper No. 1-7 — "Future Re- quirements of the Maritime In- dustries" by Hon. Harold E.
Shear, Adm. USN (ret. ), Mari- time Administrator. Secretary of the Navy, Shipbuild- ing and Logistics. Session II — Thursday, April 7. Theme — "Man/Machine Tech- nology"
Session II-A, and Stuart W.
Paper No. II-A-1—"Recent Ad- vances in Computer Graphics in the Shipyard Industry" by J.
SYNOPSIS: Computer-aided manufacturing (CAM) in ship- building started with the intro- duction of N/C flame-cutting equipment around 1960. Links between design, manufacturing and administrative computer functions are still few. Turnkey drafting systems now in use com- plement the CAM systems to some extent but faired lines from a CAM system cannot be trans- ferred into a drafting system. Also, the detail design drawings generated by a drafting system cannot be used for automatic parts generation. This paper dis- cusses the computer software used by the shipbuilding indus- try and areas in which work needs to be done to improve com- puter usage. N. Bassett and J. Rodgers. SYNOPSIS: This paper describes the development and installation of a shipboard computer system aboard a Great Lakes freighter, which performs maintenance and inventory control functions as well as crew payroll. System de- sign criteria, program operation, and system implementation are discussed in addition to com- ments on crew acceptance. Paper No. 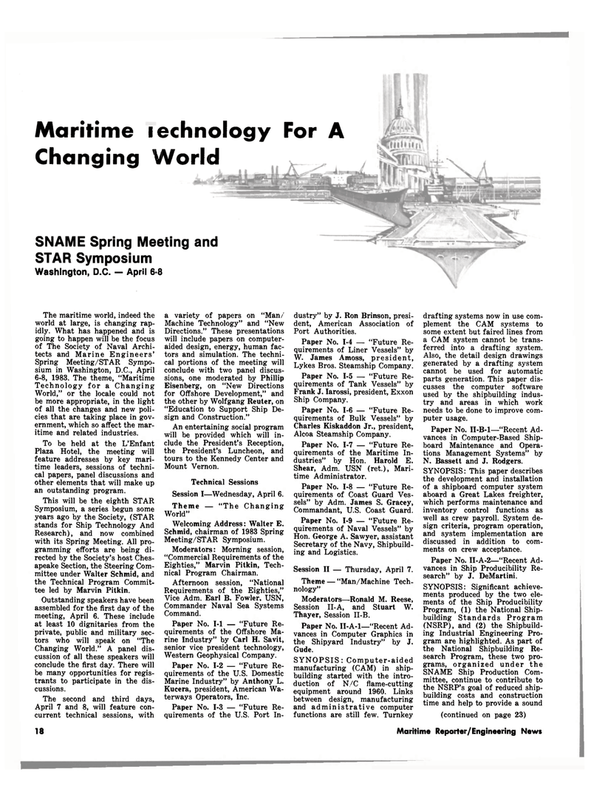 II-A-2—"Recent Ad- vances in Ship Producibility Re- search" by J. DeMartini.